Pet goats can offer companionship to you as well as some of your four-legged farm friends. The right goat can get along well with other animals while offering you love and amusement. But goats need room to roam in a fenced area, standard veterinary care and plenty of food, so make sure you're up for the challenge before getting a goat as a pet. Goats are social animals meant to survive in herds. They crave companionship, so it's best to buy at least two goats when you're looking for pets. Otherwise, you might end up with a pet goat who won't let you out of his sight without bleating incessantly. Goats can sometimes bond to other animals, such as donkeys or dogs, but they do best when there's at least one other goat present. The most low maintenance goat for a pet is a neutered male, called a wether. Because breeding is never a concern, these goats typically stay happy-go-lucky most of the time and are content to frolic inside the fence until you're ready to play. 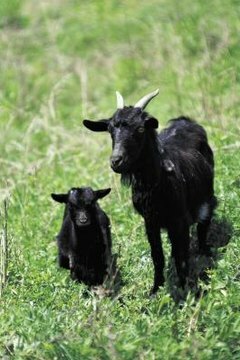 Does, or female goats, work well as pets if they've never been bred or if their kids were allowed to consume all their milk. A doe meant for milking means you must empty her udder at least twice a day. Bucks, or unneutered males, are not the best choice for pets. They develop foul odors meant to attract does, and they can become aggressive toward you and other animals. Although goats learn who you are and to come when called, they aren't likely to stay contained to your property without a fence. Goats like to eat, and they often wander off in search of their next tasty morsel without realizing they are no longer on your land. The fence must be secure, such as a wooden fence lined with chicken wire that's buried at least 6 inches underground. Goats can be little escape artists, jumping, digging or ripping their way through fences to freedom. Your pet goat needs room to run and play, so make sure the fenced area gives him his space. As far as expenses go, goats aren't the cheapest companion animals, but they aren't the most expensive, either. They need regular health checks that include vaccinations and worming, and they need grooming with hoof clipping. This is often more expensive than similar procedures for a dog because most farm vets come to you rather than you going into his office. Goats can also be destructive, chewing on wooden barn walls, for example, leading to expensive repairs. They need shelter from the sun and weather, so you must have stalls for your goats. They can share a barn with other animals such as cows or horses, but they must have separate stalls within the barn to keep them from getting hurt by the bigger animals.